Rollin rollin rollin.. Keep those wire storage racks a rollin. Mobile. Resistant. Modern. 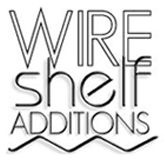 Wire shelving is used in a wide range of commercial and home applications. Wire shelving uses smooth, rust resistant chrome plated steel, which is much more affordable than other shelving or storage solutions. In minutes you can turn your wire racks in to mobile units using wire shelving wheels known as casters. Making your unit portable with wire shelving casters adds portability to your wire storage rack. Wire racks are ideal for retail displays, store rooms, catering, hardware stores, and even in the home. For those that decide to make their wire shelving units mobile, they must first decide between rubber or polyurethane wire shelf casters. Each material has its own advantages, but generally, wire shelving wheels made out of polyurethane are better for indoor transit. Use polyurethane wire shelf wheels if your floors have laminate or carpet. Rubber holds less weight than polyurethane but since it is more malleable, the wire shelving wheels will reduce bumps and shocks, making it a better choice for transit over rougher surfaces. Before selecting any type of wire shelf castors, you should know the sizes and weight of the items you are planning to store, as well as the size of the space needed to fit the wire rack. One of the best things about wire shelving is that even when it is loaded up with items, it still let’s in a lot of light. Sturdy industrial strength shelving provides easy item access, good ventilation and corrosion resistance. The open air design of heavy duty wire shelving and bright chrome finish allows for cleanliness and minimizes dirt and dust build up. They also add a bit of an industrial look that can really compliment your stainless steel appliances. Wire Shelf Additions carries products that are both easy to clean and adhere to sanitation safety standards. All our shelving products, wire shelving wheels, and accessories are NSF certified. Wire shelving casters come in a 4-pack or can be purchased as a complete rack set. Make sure to follow NSF procedure by installing your wire racks at least six inches off the floor if you’re in the food-service industry. Be sure to subtract the length of your wire shelf casters.